Why develop acceptance criteria for pipeline girth weld defects? Reliability of NDE is difficult to quantify. In addition, it is not even clear what we actually mean by NDE reliability. For hardware, as an example, terms exist to quantify reliability of components, such as MTBF or Mean Time Between Failures. In reliability of NDE, such a term does not exist. In this paper, we will discuss what acceptance criteria have to do with NDE reliability, especially when mechanized ultrasonic inspection systems are used, and why there is a need to develop such criteria for pipeline girth weld defects. In a separate paper by Mr. Forli of Det Norske Veritas, the subject of "how to develop such criteria" has been addressed. He will describe a joint industry project, now being initiated, that has the objective to develop and validate such criteria. During the Annual Conference of the German Society of Non-Destructive Testing, held in Dresden in May 1997, a panel discussion took place under the title: "Is the Certificate Replacing Morals in NDE?". There are observations that NDE quality is steadily decreasing. One of the points made was: "let's try to convince customers and users, that NDE does not have to be a necessary evil that should be purchased against minimum costs, but that it can be of benefit to the customer". When can NDE be regarded as reliable enough to be of benefit to for example the pipeline owner and the contractor? Three key words are important in this context: safety, weld quality and cost. Safety increases as soon as NDE results provide information that has a defined relation to weld integrity. This sounds obvious, but it is not. Conventional NDE provides the customer with information on weld quality, using acceptance criteria based on Good Workmanship Considerations. There is not necessarily a relation to weld integrity. Quality is assured when NDE results are a good measure for weld quality. Cost saving can be achieved when overall construction costs of a pipeline (not necessarily costs for NDE) can be reduced, without sacrificing on safety and quality. Reduction of overall construction costs could be expressed in higher production rates and less repairs. Mechanized UT as a replacement for radiography, if properly designed and performed, helps to achieve this objective. Thereby, the use of optimized acceptance criteria is vital. There are several NDE service companies that offer mechanized ultrasonic inspection of pipeline girth welds, onshore and offshore: apart from RTD in The Netherlands, there are companies in Canada, Germany, Belgium and the United States. Fig. 1 shows a photograph of the RTD Rotoscan on an offshore pipeline. The transducer arrangement is designed on the basis of the weld preparation, in such a way that all defects that can be expected are detected with maximum probability and with minimum false call rate. To this end, the weld thickness is divided in zones, each of which is covered by a separate transducer or transducer combination (fig. 2). 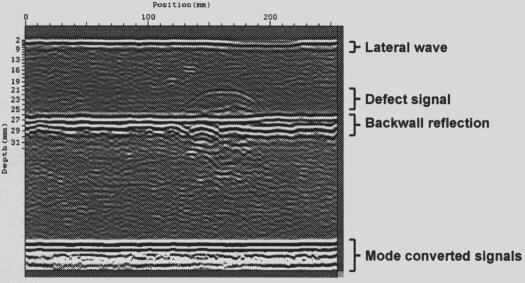 A known potential problem in mechanized ultrasonic inspection is that, especially in the root region, it is difficult to see the difference between geometry and defect signals. In good systems, this is solved by digitization of signals from the root, whereby these signals are displayed in the form of a C-scan map. This enables the use of the geometry of the weld as a reference in interpretation, just like one does in radiographic inspection (fig. 3). The same goes for detection and quantification of porosity (fig. 4). Since porosity gives only minor reflections, the only way to achieve a reliable detection ofporosity is by means of pattern recognition. The use of C-scan mapping, supported by TOFD, makes this possible. The use of the Time Of Flight Diffraction (or TOFD) technique is important. TOFD is used as a "safety net" in detection, and also for sizing of defects in through thickness direction. 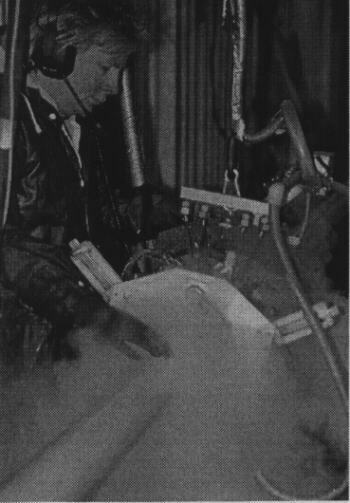 Some codes already require the use of TOFD in mechanized inspection of pipeline girth welds, in addition to pulse echo technique. A typical TOFD image, representing a "side view" of the weld, is shown in fig. 5. The fact that modern systems use a computer for data acquisition and storage not only enables a coherent display of signals, highly comprehensible for the operator, but also opens the way to automatic interpretation. The signals from the weld are in this case directly compared to the requirements of the applicable code or standard in terms of defect amplitude, length and through thickness height. Such automatic interpretation software can take over a lot of the routine work from the operator, thus avoiding errors caused by fatigue of the operator. Finally, the software should allow for automatic generation of site reports, thus avoiding typing errors and increasing speed. RTD Rotoscan has been validated and qualified at a number of occasions. This comprised not only job-directed qualification tests for clients, but also two systematic evaluation projects for the Pipeline Research Committee (PRC/) in the American Gas Association. In all those cases, a number of test welds with purposely induced weld defects were inspected with Rotoscan and with radiography, and subsequently they were destructively evaluated. The overall quality of UT is at least as good as that of RT. Although RT is still superior when it comes to detection of voluminous defects, UT has a higher probability of detection (POD) on planar defects. This is increasingly important, because the use of high strength steels (and thus thinner walls) makes planar defects more critical. False Call Rate (FCR) of both techniques are comparable. Therefore, mechanized UT leaves less chance that defects of structural concern remain undetected. This means that safety increases. Furthermore: the costs for pipeline construction are reduced. Practical experience shows that repair rates tend to decrease rather than increase. This has partly to do with the fact that welders know the NDE result within a few minutes. In this way they can timely adjust welding parameters in order to avoid defects. Considering existing Good Workmanship acceptance criteria as they have been formulated over the years, it is probably fair to say that they were designed to monitor the performance of the welder rather than to evaluate weld integrity. This is in agreement with the term "Good Workmanship Criteria". Existing Good Workmanship Criteria have been formulated with the capabilities and drawbacks of conventional NDE methods in mind. To be more specific: they are based on what one can actually see on a radiograph. Radiography is good at detecting voluminous defects, but more or less limited on planar defects. Manual ultrasonic inspection does the opposite. Both methods have limited capabilities when it comes to through thickness sizing. Planar defects are non-acceptable in almost all codes. Although this may be understandable from a fracture mechanics point of view, this is not the real reason. The presence of planar defects goes beyond the aspect of checking the welder: they might influence weld integrity. In addition, limitations of RT and UT urged code makers to reject planar defects in general. Their detection indicates that something is very wrong with the weld, without being able to really quantify. It may therefore be argued that the merit of existing acceptance criteria is more or less limited to the aspect of evaluating the welder's performance because this has always been the best we could. When we forget all this, and go "back to basics", what would we like to have in an ideal world? Good Workmanship Evaluation is a "must". This has also psychological aspects: a welder must know that he is checked. On the other hand, NDE should make certain that also the weld's integrity is OK. Track records of existing installations show that this certainty statistically exists. But there is a price to be paid: conservatism. Therefore, in the ideal situation, we would like to have a balanced combination between evaluation of the welder's performance on one hand, and a fracture mechanics basis on the other hand which can be regarded as a "safety net". This requires not only the use of adapted criteria, but also the use of an NDE technique that can provide the necessary information for both aspects: a technique that can detect small defects for evaluating weld quality as well as estimate the through thickness extent of planar defects, both with a high reliability. Acceptance criteria should thereby be formulated in such a way that full advantage of the capabilities of the NDE method is taken, without leading to unnecessarily high repair rates. It is the compatibility between the NDE technique and the criteria that counts: a balanced combination of certainty and a degree of conservatism not higher than needed. 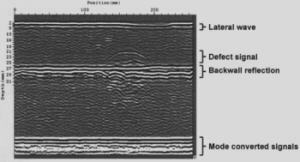 Since mechanized ultrasonic inspection is capable of fulfilling these requirements, it is an ideal technique to be combined with adapted criteria in order to take full advantage of its capabilities. This has been the reason to initiate a joint industry project to develop such criteria. With a well-designed system for mechanised UT of pipeline girth weld, safety can be increased whereby field repair rates could even decrease. If weld quality means the overall absence of all possible weld defects affecting good workmanship, mechanised UT is as least as good a tool for evaluating weld quality as radiography is. Especially the increasing use of high-strength pipeline steels makes planar defects more critical. This underlines even more, that the use of mechanised UT to replace radiography should be considered. One can only take full advantage of the merits of modern inspection systems if they go along with appropriate acceptance criteria for weld defects. Inspection system and criteria should be compatible. Of course, not only the system and the criteria, but also the infrastructure that goes with it (such as personnel training and experience, as well as the procedures) are of paramount importance. System + personnel + procedures + criteria = reliable NDE. A project is being initiated that has the development of tailor-made acceptance for weld defects in pipeline girth welds as an objective. This project will be addressed by Mr. Forli of Det Norske Veritas in a separate paper.